Oprah Winfrey looks stunning in the black Sabyasachi Mukherjee creation. 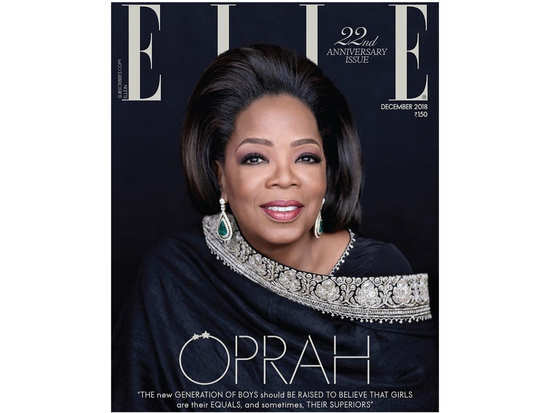 In the interview, Oprah said to Elle, “The new generation of boys should be raised to believe that girls are their equals and sometimes their superiors.” The article talks about Oprah's understanding of relationships and so much more. However, we cannot get over the fact that she can be seen gracing the magazine’s cover in a Sabyasachi Mukherjee outfit - a designer who is being rather favoured at the moment (and rightly so!) by the likes of B-Town brides such as Deepika Padukone and Priyanka Chopra. Apparently, Sabyasachi had much of a 'fan moment' when he learnt that he had to dress the diva. For the cover shoot, her number featured a silk top wrapped in a black stole with a silver embroidered border. Her look was completed with 2.9 carats Zambian emerald tear-drop diamond earrings by Sabyasachi Jewelry. Defined eyes and pink lips rounded her look off. We can't wait to get our hands on this copy! 5‘Zero's’ Issaqbaazi: Shah Rukh Khan and Salman Khan will make you want to groove along! 6Priyanka Chopra and Nick Jonas are stars of Vogue’s first-ever digital cover! 7‘Simmba trailer’: The Ranveer Singh starrer has blockbuster written all over it! 8Priyanka Chopra and Nick Jonas' mehendi ceremony was better than we ever imagined it would be! 9Priyanka Chopra and Nick Jonas are now man and wife!